A recent piece in The Economist raises a provocative question: social networking sites such as Facebook, MySpace, and Bebo have grown tremendously in usage, but are they viable businesses? In other words, is it possible to monetize these services in an effective fashion? To answer this question, it helps to take a step back and look at the monetizability of social media as a whole. Since most social media sites rely on advertising revenues, let us restrict ourselves to advertising as the monetization mechanism. Regardless of the model (CPM, CPC, CPA), advertisers value three key measures: reach, frequency, and targeting. Many social media sites certainly score high on reach and frequency, but how do they fare on targeting? Targeting is key, because it determines the CPM rates advertisers are willing to pay. And CPM rates vary very widely: from $16-20 for TripAdvisor to $0.10 for Facebook and MySpace. See, for example, this media plan. What drives such a wide divergence in CPM rates among social media sites? Are the low rates at social networking sites a transient aberration, with higher rates around the corner as advertisers get more comfortable with the medium? And is there a simple model to predict the targetability of different forms of social media? Remarkably, there appears to be a single factor that explains a great deal of the available data. Consider the difference between a Facebook profile and a TripAdvisor travel review. A typical pageview on the former is by someone known very well to the creator of the profile – a close friend or acquaintance. On the other hand, a TripAdvisor travel review is seen by people completely unrelated in any way to the person or persons who wrote the reviews on the page. We quantify this distinction with a measure called affinity. The “affinity” of a social media service is the average closeness of relationship between a content creator and someone who views that content. The affinity of Facebook is very high, while the affinity of TripAdvisor is very low. Here’s the key observation: There is an inverse relationship between the affinity of a social media service and its targetability. Why is this true? The act of viewing a Facebook profile gives us very little information about the viewer, other than the fact that she is friends with the profile creator; when someone views a TripAdvisor travel review, she is definitely interested in traveling to that location. I estimated the affinity of several forms of social media, and plotted affinity aginst CPM (which I used as a proxy for targetability). 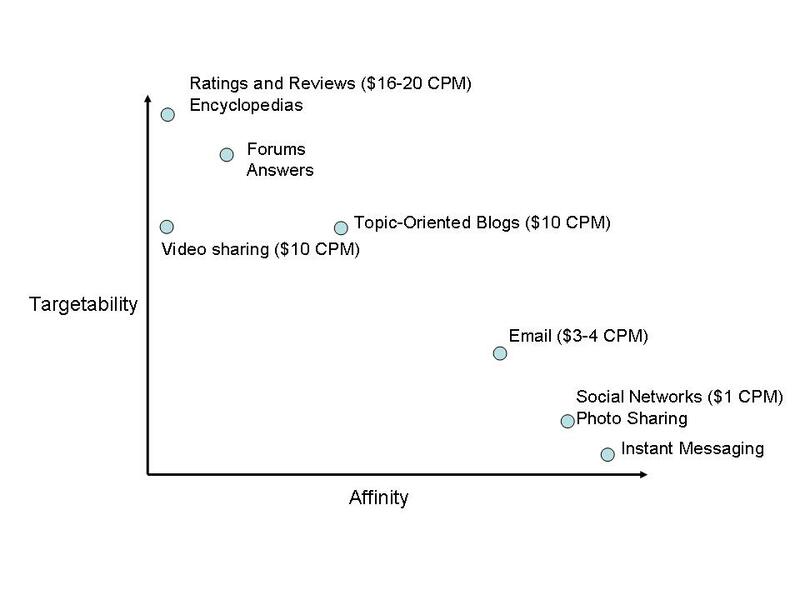 The resulting graph (click for a larger image) shows the landscape of Affinity versus Targetability for several forms of social media. Some of these data points are from published data and others are extrapolated. We can see that there is a strong inverse proportionality, with a couple of outliers. We’ll get to the outliers in a moment; for now, note that Social Networks and Photo Sharing sites are even higher affinity (and therefore lower targetability) than email. This is because we often email people we don’t know or know only in passing. Instant messaging has the very highest of affinities: my IM buddy list includes only my very closest friends, who I trust with the ability to interrupt me any time of the day. What about the outliers? Video sharing sites, such as YouTube, have low affinity, because the majority of people see videos posted by people they don’t know. However, the targetability is lower than we would expect, because of a compensating factor: herding. Most people see videos featured on lists such as “Most Popular”, which reduces the targeting value of such videos. This is also true of social news sites such as Digg. This is a broad brush-stroke, and individual services might well differ from the overall category. For example, popular blogs have much lower affinity and therefore much higher CPMs than the typical blog. Targetability is not the only factor determining CPM; there are others. For example, certain viewer intents are inherently more valuable than others. But with these caveats, this simple model is highly instructive. We may conclude that, when all the dust settles, the CPM rates of instant messaging services will not exceed those of social networks, which will not exceed those of email. These are inherently low CPM businesses. Create sections of the network that are more topic-oriented, and less about individuals. For example, band pages and groups on MySpace, and Facebook groups. Mine individuals’ profiles, or their off-site behaviors, to target them behaviorally rather than contextually. This approach carries with it dangers of privacy violations, as the Facebook Beacon fiasco demonstrates. If social networks are to become a viable business, they need to pursue aggressively one or both of these approaches. Of course, it may be possible for some services to sidestep this question entirely and develop business models that don’t depend on advertising. We haven’t seen such a model emerge yet, but there is so much creativity and ferment in this space that it might just happen. Update: I received some questions about the affinity versus targetability landscape. Here's a brief description of the methodology. I used published CPM numbers where they were available; e.g., Yahoo Mail ($3-4), TripAdvisor ($16), Facebook ($0.10-0.15). Note that published CPMs are generally to be taken with a pinch of salt, since they may apply only to small portions of the overall publisher inventory and not represent real market-clearing prices e.g., Google's stated goal of $20 CPM for YouTube -- only a very small number of YouTube videos show ads today. I've used Metacafe's $5 net CPM payout to video producers as a more reasonable benchmark -- this likely represents a gross CPM of $10 assuming a 50% rev share. For blogs, the numbers are all over the place: BlogAds ratecards for various blogs vary from $1-$4CPM, Valleywag reports $6.50-$9.75, and Federated Media has ratecards charging $7-$40. I took $10 to be a median for blogs with reasonably high traffic. Some of the other data points are based on guesses and informal conversations, since these sites typically don't publish their CPMs. Please email me if you have additional data on these; I will update the graph accordingly. 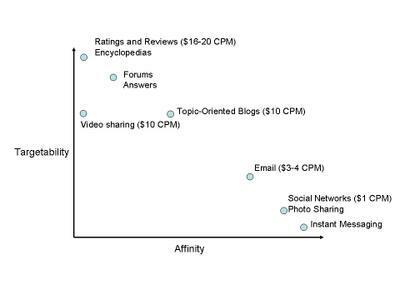 "This image shows the landscape of Affinity versus Targetability for several forms of social media." This graph is very interesting, but, since there are no numbers on the graph, I guess it represents your subjective opinion. I think it would be worthwhile to try to get some objective numbers. Reality has a fascinating way of biting back when you poke it. In cases where affinity is high, frequency is also likely to be high. That might well compensate for low targetability. Also, as you said, it would make sense for social medai to have some topical content, whose viewing is not a function of affinity. Finally, it's important or social networks to realize that friends only exist to bring stickiness to the site. Friends cannot and most likely, will not create good content that can support advertising. Editorially created content might just help. I feel the act of viewing a facebook profile could give a lot of information about the viewer assuming the person viewing is also a facebook user. A facebook user profile exposes tons of information (for instance her interests, friends, background, location, etc.). Won’t this data lead to better targeting? Maybe this data used more effectively might improve targeting. Does nature of intent (i.e. transient vs. persistent) have a role to play in all this? Social media sites lack transient intent so although they may know a lot about their visitor they don’t really know what she is precisely interested in at a given point in time. They don’t have even have content in the first place to satisfy the different user needs. Instead search engines and transient intent sites such as wikipedia, travelocity, kosmix, etc. meet that need but even those thrive to learn more about their visitors. As you already alluded to (by topic pages) if social media sites start providing content that start addressing transient intent they could improve targeting. Maybe social media sites are not so great for highly targeted ads but for ads that build brands (e.g. banner ads). Like television channels they could become great platforms for building brand awareness. So targeting may not even be a strong measure to understand value of advertisement on social media sites. Peter Turney: I've updated the post with some details of my methodology, and added the numbers to the picture. Abhishek and Bharath: I don't entirely buy that reach and frequency (i.e, sheer volume) makes up for targetability. In the long run, there will be a huge aggregate number of untargeted page views across the web, and these will all sink to roughly the same CPM levels i.e, close to their serving costs. It cannot be otherwise if CPM rates are rationally determined based on supply and demand, which they will be in the long run, even if they are not in the short run. Therefore, targetability is key to building a sustainable ad-supported business. The analysis is spot on. FaceBook and MySpace are like virtual worlds in themselves and as such should take cues from SecondLife or WoW and start renting 'digital space' to advertisers rather than pushing ads to users. Charge for participation in the network rather than annoying users with annoying display/text ads. Let the 'topical' pages you cite attract users rather than the other way round .. After all people don't live in vacuum .. they are as vocal about brands they like and don't like and products they consume. Its so much part of their identity. Exploit that!! "Peter Turney: I've updated the post with some details of my methodology, and added the numbers to the picture." What I meant was that there are no numbers on the X and Y axes. I know its not easy to do, but "targetability" and "affinity" should be quantified. You say CPM rates are a proxy for targetability, which sounds like a reasonable approximation to me, so the Y axis should be labeled with CPM rates in dollars. Now what can be a proxy for affinity? How can we label the X axis? Maybe affinity could be estimated by the geographic diversity of the visitors to a page? The comments on TripAdvisor are labeled with the city where the commenter lives. I just now looked at some comments on Toronto hotels, and the commenters are all from Canada or the US. Maybe TripAdvisor has a higher affinity than you assume? Now I took a look at Facebook, where "friends" are tagged by the "networks" that they belong to, and these "networks" are mainly geographical. Some of my "friends" are in networks called "India" and "China", although I haven't been to either of these countries. Maybe Facebook has a lower affinity than you assume? This could be made more rigorous with just a little bit of work. Randomly sample N hotels in TripAdvisor and calculate the average number of different countries of the commenters, per hotel. Randomly sample N people in Facebook and calculate the average number of different countries of the friend networks, per Facebook user. Peter T: Great suggestions. Will get on it and report back. YouTube is being extremely precise and careful about the implementation of the ads. Ads will show up no earlier than 15 seconds into a video, will be overlayed on the bottom 20 percent of a video with 80 percent transparency. I notice to Colorado tourism folks took down the rate card (PDF) you linked to.